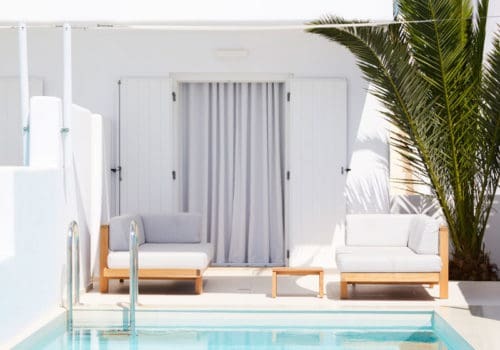 Kyma is Greek for ‘wave’, and equally the last word in sophisticated hospitality on Mykonos. This 5-star haven of luxury soars high above Mykonos town. A strikingly beautiful and intimate 5-star member of Design Hotels has cultivated a loyal jet-set following that prizes not only the world-famous views of the windmills and Little Venice, but the warmth of its hallmark service, cool ambience and beautiful bones. Neither too trendy nor too traditional, Kyma is a place for true originals. It hits the right note between laid-back luxury and meticulous attention to detail – revealing a world of sublime experiences, lush gardens, panoramic views, private terraces, and art-filled spaces that come alive in contrasts of marble and wood. Bright and well-conceived, this 26m2 room is fashioned in graceful contemporary style with exquisite materials, designer furniture and lighting, and an abundance of white linen. An excellent choice for a genuine Myconian experience. The soothing white and simple lines of this 26m2 room create a unique atmosphere, enhanced by the harmonious combination of eclectic furniture and design objects. From the private balcony, you will enjoy views of Mykonos town and the Aegean. In homage to the glorious Aegean and to the unique minimalist aesthetic of Myconian architecture, Nissos is a strikingly beautiful suite, filled with luminous white interiors that combine fine art objects and soft textures with the sleek luxury of a marble bathroom, an abundance of high-tech comforts and superb views from the balcony. Altogether an unforgettable place to be. This is a Junior suite with a contemporary open flow that opens out onto a terrace and private Jacuzzi with views of the pool and the Myconian landscape. The bathroom experience is pure indulgence, with a deep bath, rain shower and amply stocked with luxury cosmetics. Coming from the vibrant atmosphere of the outdoors, it is an oasis of quiet intimacy and luxury. The room may accommodate up to 2 people. An exceptional retreat, this is chic elegance epitomised. Sumptuously decorated with the finest of materials, fabrics and art objects, equipped with high-tech amenities and a lavish marble bath, it redefines the meaning of ‘suite’. Out on its generous veranda, the infinity pool with the spectacular Aegean background will tempt you to linger forever. Guests absorb slow-motion pleasures in this timeless environment, enhanced by a recent renovation that accessorised its classic chic with a bevy of iconic 1960s design beauties. The pool deck is the heart of the hotel, a brilliant blue gem surrounded by shaded sunbeds, an outdoor lounge and a fabulous bar that lives up to its reputation as a hotspot, by day and night. Some villas sport terraces with a private pool or Jacuzzi that almost eclipse the dazzling Aegean view. Here you’ll relax and recharge in the hands of superb therapists in serene spa, and you can rely on the expert advice of Guest Relations to make almost anything possible. The best way to start the day is by taking in the sea views along with the plenitude of the morning buffet laden with a variety of utterly delicious breakfast favourites: organic eggs prepared however you like them; freshly-baked breads and patisserie still warm from the oven; the finest homemade preserves and wild honey; cereals that include gluten-free options; fruit, fresh juices and smoothies; as well as a select assortment of international delicacies. Rich Mediterranean flavours and appetising aromas come into their own with the use of the finest seasonal ingredients and produce, grown or reared locally and exclusively for Kyma and carefully selected by executive chef. The journey of transformation begins with mixing culinary heritage and contemporary innovation to create haute cuisine. And it finds its perfect ending in the most elegant ambience at your table, as you enjoy the subtle flavours amidst the natural splendour that recalls their provenance.